Exporting .dll files for windows vsti from a mac project file. So i want to make vsti using HISE and I have been able to create au, vst files on a mac OSX, now i want to use the same sample and mapping and export it as a .dll for usage in windows, since i cannot do this natively in mac OSX I moved the project file to a windows pc and edited the sample mappings in the .xml file manually, but i'm unable to export it as a working vst, when I try to save the samples as on big monolithic file HISE throws an error saying that the samples are not in the specified location. how do I resolve this?, is there a more efficient way to create vsti for windows using the same project file form mac OSX. But since i am working in two different machines, and my OSX sample location is different from the Windows Location, dont i have to link the samples appropriately? This is stored in a mac OSX machine and in the xml file the complete path is mentioned, not a relative path. <sample Root="67" LoKey="67" HiKey="68" LoVel="0" HiVel="127" RRGroup="1"
I am just copy pasting the project folder from mac to windows. 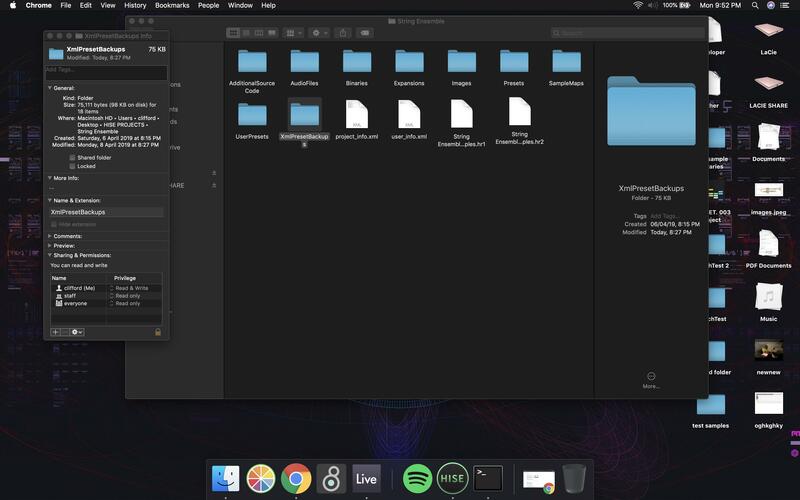 is this the right way of porting a project from mac to windows? @glitchunow It looks like your using a custom folder structure. Could you show me an image of the folder tree for your project? @glitchunow Your samples should be in a folder called Samples inside the project folder. der called Samples inside the project folder. Okay so when i make a project with the samples inside the Samples folder i can port the project file to a windows computer , open HISE and hit export? or are there any other instructions and methods to be done? @glitchunow That should work fine. You should save the samples to monoliths before moving to another computer. I'm not sure how much of a difference it will make but I generally have less issues with sample maps after saving monoliths. Leaving everything as native wav samples makes the whole process very fragile.